Sifu Smith is the first disciple of our Grandmaster, SiGung Randy Bennett and the first of those disciples to become a Jow Ga Kung Fu Master – in 2011! Sifu heads up the current generation of Australian Jow Ga Instructors and a new generation of Jow Ga students at our CBD Academy. He studied for 10 years directly under our late SiGung and has taught Jow Ga with us since 2005. 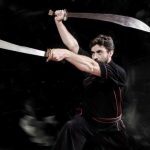 Sifu is renowned for his standout double broadsword form which was taught to him by SiGung Randy Bennett. Sifu Smith is a Cert IV accredited Fitness Instructor holding Working With Children Clearance. He is also a professional stuntman and Arnis trainer. Since 1996 Sifu John trained at Australian Jow Ga Kung Fu under the direct tutelage of Grandmaster Randy Bennett. 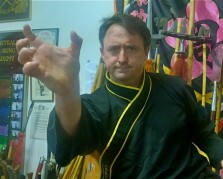 Sifu John is a Kung Fu Master and kung fu champion. He frequently performs with our team, leads our instructors and students, and represents us internationally at least twice a year. In November 2017 Sifu represented our school and Australia at the World Kung Fu Championships in China, winning a silver medal. Sifu John is an Accredited Coach – Working with Children clearance. He also enjoys Wushu, sparring, and performing Chinese Lion Dance. Sifu John teaches kids and adults Jow Ga Kung Fu at our Surry Hills HQ and also teaches Intermediate to Advanced classes – which run in series throughout the year. Jeremy has trained for 26 years at Australian Jow Ga. He is a 6th Degree Black Belt Instructor, an NCAS Accredited Martial Arts coach and has Working with Children clearance. Jeremy particularly enjoys animal forms such as Tiger and Crane. He also loves difficult Northern-style weapon forms such as Three-Sectional-Staff and Double Hook swords. 11+ years at Australian Jow Ga, Murrielle holds Black Belt 10th Degree and is a master Adults and Juniors Kung Fu Instructor in Surry Hills and Chatswood. Murrielle was honoured by SiGung Bennett as his chosen disciple in recognition of her level of expertise and her devotion to Jow Ga Kung Fu. She is a Striking & Kickboxing Trainer, Accredited Martial Arts coach. She has Working with Children clearance and is a Registered Personal Trainer and Fitness Professional. Murrielle loves performing with our kung fu and lion dance troupe in Sydney and in China and Hong Kong. Phil began training at Australian Jow Ga 23 years ago. He has been one of our lead Black Belt Kung Fu instructors in Surry Hills since the year 2000. His special interests are in teaching beginners, practical kung fu techniques and supervising sparring. Phil’s favourite kung fu forms are Jow Ga’s Double Broadswords and Wushu’s Three-Sectional-Staff verses Staff. Azuma is SiGung Randy Bennett’s son. He has trained at Australian Jow Ga Kung Fu his entire life. Azuma is a Cert IV Registered Personal Trainer, Group Exercise Instructor, Fitness Professional and a Certified Martial Arts coach. He is a key Striking & Kickboxing Trainer at our Sydney HQ. He has extensive experience in Kung Fu, Boxing, TKD and Muay Thai. He is also a Personal Trainer at Fitness First Mosman and Boxing trainer at Bondi Boxing. Sifu John completed his Jow Ga master training in November 2016! He has been with us for 10 intense years of kung fu training directly under SiGung’s personal teaching and is an Accredited Coach with Working with Children clearance. He enjoys sparring, attending our Striking & Kickboxing classes, wooden dummy practice, traditional lion dance and all aspects of kung fu. John has travelled with our team to China and Hong Kong and opened a branch of Jow Ga Kung Fu in Whakatane, New Zealand in 2018. 10 years training at Australian Jow Ga Kung Fu, Sydney – Amanda is an NCAS Accredited Martial Arts coach with Working with Children clearance. Amanda teaches in Surry Hills. She loves taking dynamic Kung Fu warm ups and teaching kung fu forms. She has a keen interest in Northern Chinese weapon forms – her favourites include Wushu Straight Sword, Jow Ga Double Daggers and Chung Chuan Fan.